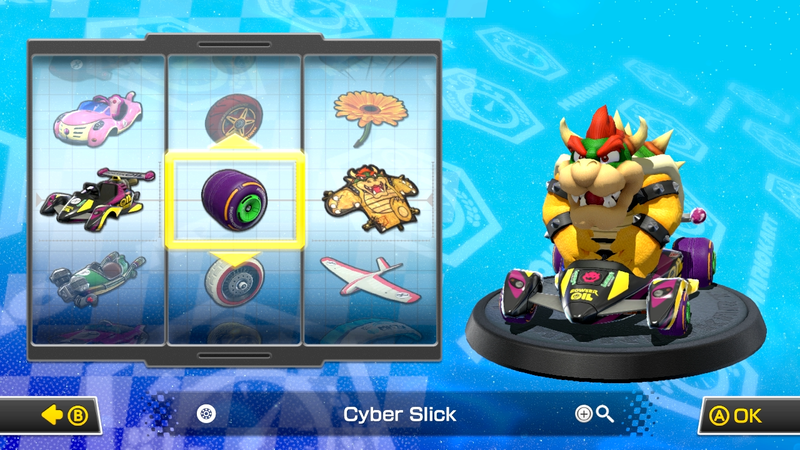 The character, kart frame, tires and glider needed to build the best kart/character combos in Mario Kart 8 Deluxe. In Mario Kart 8 (and in turn Mario Kart 8 Deluxe) you have to make a series of choices to determine your character and kart. Mario Kart 8 Deluxe might look cute but there’s a whole lot of depth lying beneath this cuddy exterior. In this Mario Kart 8 Deluxe Kart Combo guide we’ll explain how to pick a great setup and what your choices mean to kart performance and handling. No longer will you simply pick kart parts at random and hope for the best. You'll be able to make the best kart in Mario Kart 8 Deluxe and easily beat you friends who are still just picking parts at random. If you’re happy with your current kart and character combo and want other Mario Kart 8 Deluxe guides, head on over to our Mario Kart 8 Deluxe Guides Hub. We’ve got loads more content to help you get better at the game. Character Classes are one of the key factors in your racing performance. Characters are split into Light (Toad and the like), Medium (Mario, Peach, and similar), and Heavy (Bowser, DK, and the like). Things are slightly more complicated than that, with Light and Medium having two classes each while Heavy has three. Light characters have excellent acceleration but a fairly poor top speed and are easily knocked around. Heavy characters are slow off the mark but can reach high top speeds and are bosses on the track. Medium characters, as you might expect, are a mixture of both and end up falling in the middle. The sub class each character falls into will determine exactly how the stats are arranged, but the general make up is the same. When you’re first starting out in Mario Kart 8 experiment to see which type you prefer. If you’re just playing for fun you’ll likely just want to pick your favourite Nintendo character, but if you want to set top times in Time Trial or compete with the best in GP events you’ll need to put together the best kart and character combos. The perfect combination of character, kart, tires and glider is quite a subjective choice, with the performance you get out of it depending on how much you like the feel of the setup. You might like a kart that has quick acceleration so you don’t feel you’re losing too much time after taking a hit, while others might prefer to go for higher top speeds and bank on evasive maneuvers to avoid being slowed down. We reckon we’ve found an excellent option that is worth trying out. This could well be the best Kart in Mario Kart 8 Deluxe. With this kart setup you’ll have something that can reach high speeds, isn’t easily pushed around, and can still maintain a good grip of the track. You could go for a build with less traction, making for a slippery feel, allowing for faster times but less robustness on track. We wouldn’t recommend doing this unless you’re sticking to Time Trial events. If you’re looking for more help with Mario Kart 8 Deluxe, check out our guide to boosting, our look at the items in Mario Kart 8 Deluxe, and how to get Gold Mario in Mario Kart 8 Deluxe. With this guide hopefully you’ll be well on your way to Mario Kart 8 dominance. Tagged with Guides,	Mario Kart 8 Deluxe,	Nintendo,	Switch.